Are you throwing a party for Cinco de Mayo? It's time to celebrate our neighbors south of the border and we have healthy food recipes, swaps for better-for-you Mexican ingredients, and of course, low-cal margarita recipes. Are you throwing a party for Cinco de Mayo? It's time to celebrate our neighbors south of the border and we have healthy food recipes, swaps for better-for-you Mexican ingredients, and of course, low-cal margarita recipes. Since, what would Cinco de Mayo be without a margarita? Cinco de Mayo doesn't have to be a diet disaster. Dishes like black bean soup, chicken quesadillas, and edamame guacamole are perfect ways to enjoy Mexican fare without a ton of calories. Make a pitcher of these 180 calorie Frosty Blended Margaritas, and you'll be ready to kick off your celebration. 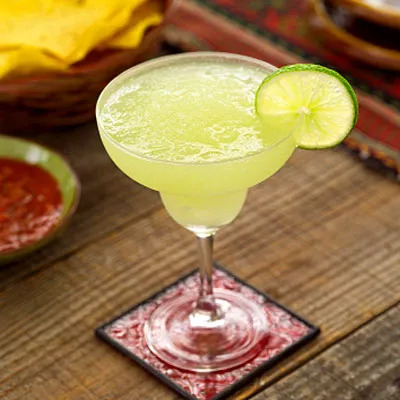 Ingredients: lime wedges, kosher salt for the glasses' rims, 1/2 cup juice from Mexican limóns or fresh limes, 1/4 cup tequila, 1 1/2 tablespoons Cointreau (orange-flavored liqueur), 2 1/2-3 tablespoons superfine sugar, and 12 ice cubes. First, run a lime wedge around the edge of each glass. Then dip rims into a saucer filled with the salt. Next, put the remaining ingredients into a blender; blend until the ice cubes are chipped and the mixture becomes frothy. Pour the mixture into the prepared glasses; garnish with lime. Now, you're ready to celebrate!